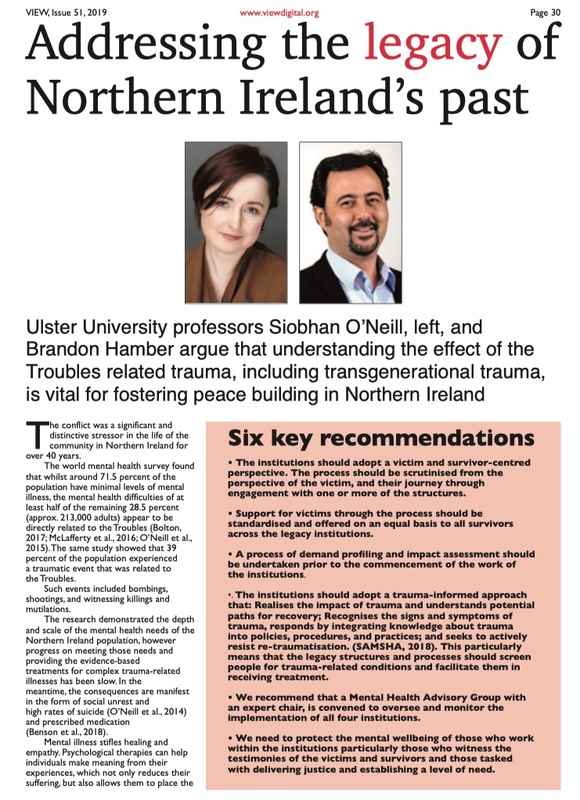 Ulster University professors Siobhan O’Neill, left, and Brandon Hamber argue that understanding the effect of the Troubles related trauma, including transgenerational trauma, is vital for fostering peace building in Northern Ireland. The conflict was a significant and distinctive stressor in the life of the community in Northern Ireland for over 40 years. The world mental health survey found that whilst around 71.5 percent of the population have minimal levels of mental illness, the mental health difficulties of at least half of the remaining 28.5 percent (approx. 213,000 adults) appear to be directly related to the Troubles (Bolton, 2017; McLafferty et al., 2016; O’Neill et al., 2015). The same study showed that 39 percent of the population experienced a traumatic event that was related to the Troubles. Such events included bombings, shootings, and witnessing killings and mutilations. The research demonstrated the depth and scale of the mental health needs of the Northern Ireland population, however progress on meeting those needs and providing the evidence-based treatments for complex trauma-related illnesses has been slow. In the meantime, the consequences are manifest in the form of social unrest and high rates of suicide (O’Neill et al., 2014) and prescribed medication (Benson et al., 2018). Mental illness stifles healing and empathy. Psychological therapies can help individuals make meaning from their experiences, which not only reduces their suffering, but also allows them to place the experience in context, to foster recovery. Such processes at both a personal, and community level can promote peace-building, and potentially create the environment for peace. For victims and survivors of trauma, the issues of truth, justice, accepting responsibility, compensation and official acknowledgement are also part of this “meaning making” and are interwoven with healing (Hamber, 2009). In fact, healing, often promoted by addressing wider victim issues such as truth and justice, in such circumstances may provide the conditions for post-traumatic growth (Joseph, 2015).The opposite is also true, that failing to address the wider needs of survivors (such as a desire for justice or truth) can have negative psychological consequences into the long term (Hamber, 2009). We made these points in response to the consultation on the proposed legacy institutions (O’Neill and Hamber, 2018, see our full response), and also noted that the institutions will have a profound impact on the mental health of the individuals who engage with them, those who for whatever reason choose not to, and those with existing trauma-related conditions who either participate, or hear about them from the media and other sources. It is vital that the mental health of those affected is protected through this process. 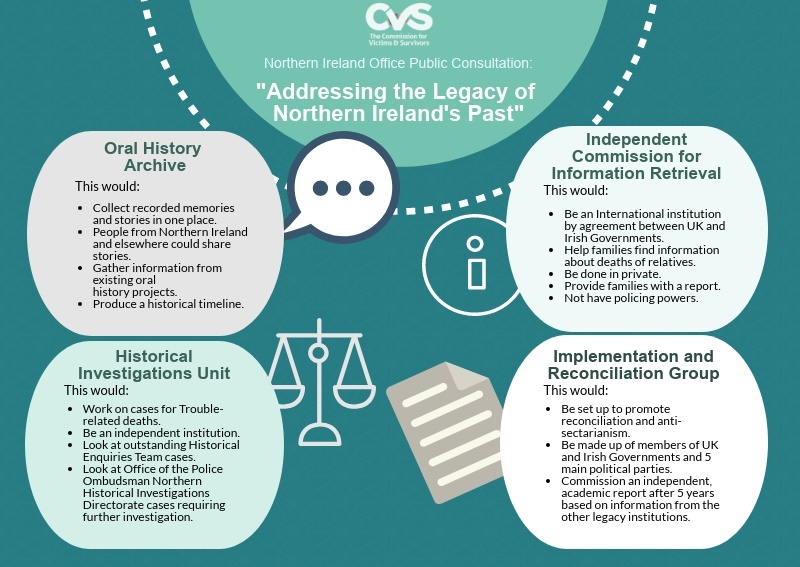 The consultation – ‘Addressing the legacy of Northern Ireland’s past’ – includes proposals to implement the four new legacy institutions set out in the 2014 Stormont House Agreement (SHA) and the Government’s manifesto for Northern Ireland 2017. A key element of the Stormont House Agreement is that all of these bodies will be under statutory obligations to act in ways that are balanced, proportionate, transparent, fair and equitable. The institutions should adopt a victim and survivor-centred perspective. The process should be scrutinised from the perspective of the victim, and their journey through engagement with one or more of the structures. Support for victims through the process should be standardised and offered on an equal basis to all survivors across the legacy institutions. A process of demand profiling and impact assessment should be undertaken prior to the commencement of the work of the institutions. The institutions should adopt a trauma-informed approach that: Realises the impact of trauma and understands potential paths for recovery; Recognises the signs and symptoms of trauma, responds by integrating knowledge about trauma into policies, procedures, and practices; and seeks to actively resist re-traumatisation. (SAMSHA, 2018). This particularly means that the legacy structures and processes should screen people for trauma-related conditions and facilitate them in receiving treatment. We recommend that a Mental Health Advisory Group with an expert chair, is convened to oversee and monitor the implementation of all four institutions. We need to protect the mental wellbeing of those who work within the institutions particularly those who witness the testimonies of the victims and survivors and those tasked with delivering justice and establishing a level of need. O’Neill, Siobhan and Hamber, Brandon (2019). Addressing the legacy of Northern Ireland’s past. The View Digital, Issue 51, pp.30-31. This article was published by The View Digital (Issue 51, 2019), to download a Pdf of the article as it appeared, click here. To download the full edition of The View Digital which features "An in-depth look at victims, survivors and legacy issues from the Troubles", click here. Learn more about The View Digital, click here. Benson, T., Corry, C., O’Neill, S., Murphy, S., Bunting, B. (2018). Use of prescription medication by individuals who died by suicide in Northern Ireland. Arch Suicide Res, 22, 1, 139-152. Download. Bolton, D. (2017). Conflict, peace and mental health: Addressing the consequences of conflict and trauma in Northern Ireland. Manchester: Manchester University Press. Hamber, B. (2009). Transforming Societies After Political Violence: Truth, Reconciliation and Mental Health. New York: Springer. Joseph, S. (2015). A person-centred perspective on working with people who have experienced psychological trauma and helping them move forward toward post-traumatic growth. Person-Centered and Experiential Psychotherapies, 14(3), 178-190. McLafferty, M., Armour, C., O'Neill, S., Murphy, S., Ferry, F., Bunting B. (2016). Suicidality and profiles of childhood adversities, conflict related trauma and psychopathology in the Northern Ireland population. J Affect Disord, 200, 97-102. Download. O'Neill, S., Ferry, F., Murphy, S.D., et al. (2014). Patterns of suicidal ideation and behaviour in Northern Ireland and associations with conflict-related trauma. PLOSOne, download. O’Neill, S., Armour, C., Bolton, B. et al., (2015). 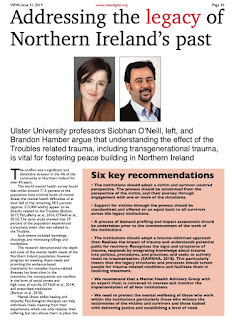 Towards a Better Future: The Transgenerational Impact of the Troubles on Mental Health. Belfast, CVSNI. Retrieved from here. O’Neill, S. and Hamber, B. (2018). Consultation Response: Addressing the Legacy of Northern Ireland's Past. The need for a victim and survivor centred, trauma-informed approach. Retrieved from here, 25th Feb 2019. SAMHSA (2018). Trauma-Informed Approach and Trauma-Specific Interventions. Download. The government launched a consultation on "Addressing the Legacy of Northern Ireland's Past" earlier in 2018 with a closing date of October 2018. As part of the responses to the consultation Professor Siobhan O'Neill and myself made a submission on "The need for a victim and survivor centred, trauma-informed approach". To read the submission, download here. The government launched a consultation on "Addressing the Legacy of Northern Ireland's Past" earlier in 2018 with a closing date of October 2018. As part of the responses to the consultation myself and Grainne Kelly made a submission on Reconciliation. Reconciliation is a stated principle and aim of the Consultation Paper: Addressing the Legacy of Northern Ireland’s Past (May 2018). Reconciliation is noted in the consultation document under principles, that is “the principle that reconciliation should be promoted”. Later in the document reference is made to the Implementation and Reconciliation Group (IRG) with its stated aim “to promote reconciliation and anti-sectarianism and to review and assess the implementation of the other legacy institutions proposed in the Stormont House Agreement”. Drawing on our body of research work on reconciliation undertaken over a 14 year period the main points we make, expanded in our submission, is that although reconciliation is a stated aim and principle of the process (and the Secretary of State also affirms this in the Foreword) there is, firstly, no attempt to define what is meant by reconciliation. Secondly, the document does not outline how reconciliation might be supported and promoted. We understand that implementation might be the task of IRG members, but our research findings suggest that this might be very difficult for a number of reasons. We argue that the current proposed structure of the IRG, and the appointment process in particular, will compound the challenge of reconciliation. At the same time, we believe that the work we have done in defining reconciliation could be beneficial to the process. Many see the 5th of October 1968 as the beginning of the contemporary conflict in and about Northern Ireland, the day when the so-called second civil rights march took place in Derry. In 2018 the 50th Anniversary Commemorative Festival took place with events held across the city. It was fantastic to host the organising committee and friends of the festival for a dinner at the Magee Campus on 7 October. It was a fitting occasion to mark this important moment in history, and to thank the committee for their work in organising the festival. To acknowledge contemporary rights issues the dinner also included inputs from the Chief Executive, Adrienne Darragh, from the Hibiscus Initiative working on contemporary slavery and trafficking issues, as well as Kay Glynn from Birnberg Peirce who worked on the Hillborough Inquest and are currently working on Grenfell inquest. For the last three years David Coyles, myself (Brandon Hamber) and Dr Adrian Grant from Ulster University, with partners from LSE (Ann Power and Laura Lane) have been involved in a project called "Cartographies of Conflict". 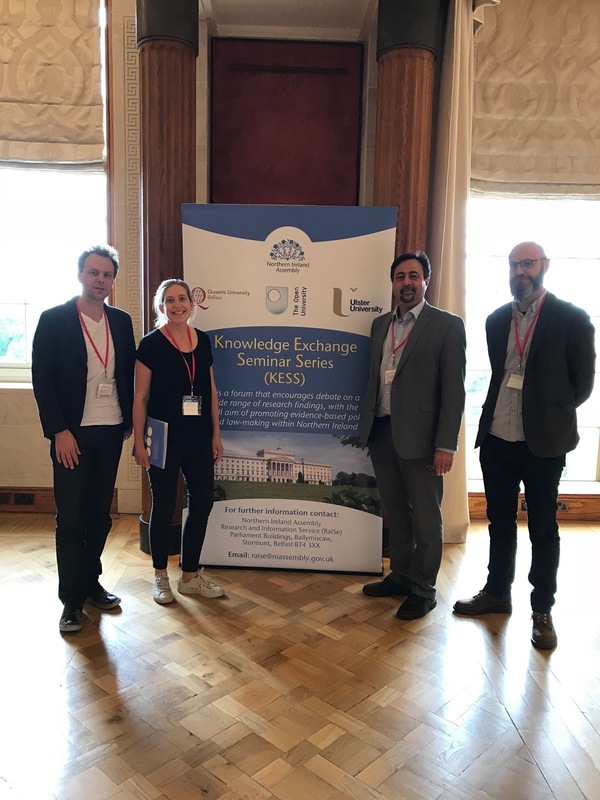 On 18 June 2018 we presented some initial findings from the research entitled "Hidden barriers and divisive architecture: the case of Belfast" at Stormont at a KESS Seminar. Find out more about Cartographies of Conflict project. The “peace-walls” in Belfast are particularly symbolic of the role that architecture plays in separating residential communities and a comprehensive scholarship continues to assess their effects. This presentation outlines original findings from a three-year multi-disciplinary academic research project funded by the Arts and Humanities Research Council, which extends this current understanding of physical and social division. It reveals new evidence of a distinct and important, yet largely unrecognised, body of divisive architecture; an extensive range of ‘hidden barriers’ embedded in various architectural forms across Belfast’s residential communities. The presentation draws on six distinctive case-study communities that have been subjected to the implementation of ‘hidden barriers’ during the comprehensive redevelopment of social-housing during the Troubles: all six communities fall within the top ten percentile of the most deprived electoral wards in Northern Ireland with comprehensive, evidence-based examples of less visible and undervalued forms of social and physical division. The case studies provide a rigorous and reliable evidence base drawn from qualitative fieldwork that includes architectural mapping, photography, community focus groups and in excess of 100 community interviews. This data is underpinned by new and extensive archival research and analysis of NINIS statistical data. The presentation explains how emerging findings from the research reveal complex and multi-layered impacts that these “hidden barriers” have on community relations and community regeneration policy aspirations that are central to the implementation of the Executive’s ‘Together: Building a United Community Strategy’. It concludes by outlining recommendations on how these issues could be addressed within current policy frameworks, presenting the case for the development of novel and bespoke approaches to issues of concern, with a focus on housing, tourist development, and infrastructural investment. 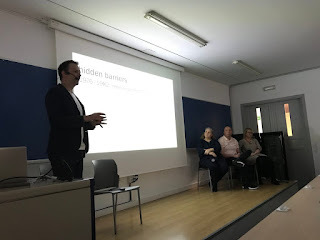 Presenting in the Basque Country on "Hidden Barriers"
On 17 of May 2018, the team from the Cartographies of Conflict project (all project posts), along with community representatives from Northern Ireland visited the Basque Country. Part of the visit focused on presenting some of the findings of the project to date which tracks "Hidden Barriers" in Belfast (click here for more information on the project). 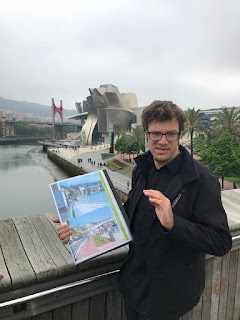 A second part of the trip focused on learning about planning issues and social regeneration in the Basque Country. What is this thing called Reconciliation? © Copyright 2015 | Brandon Hamber All Rights Reserved. Simple theme. Powered by Blogger.